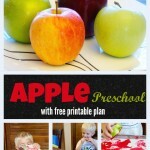 This last week I started preschool with Big Boy. 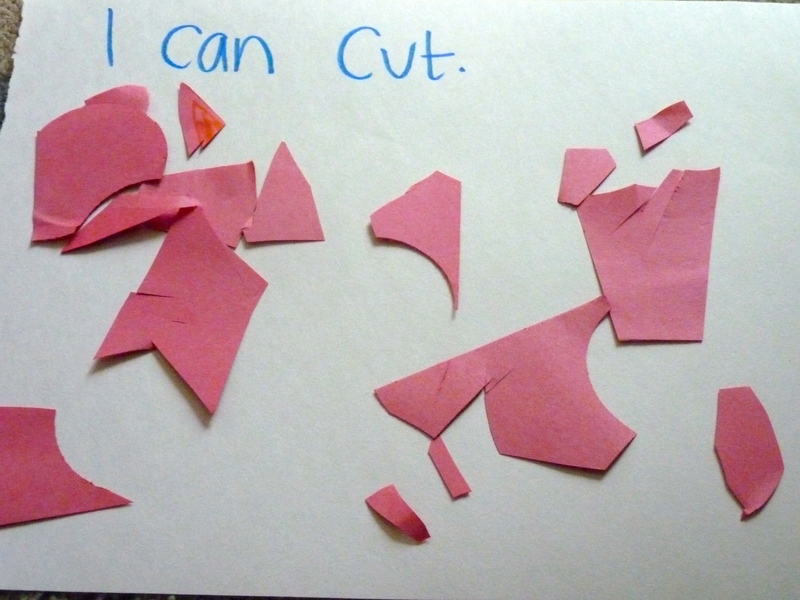 We were focusing our learning on the topic of all about me. We had lots of fun learning and exploring together. However, I quickly learned that teaching a boy is very different from teaching a girl. 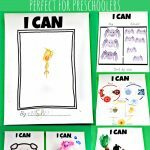 When I would teach preschool to Sweet Girl we could choose a time, sit down and move from one activity to the next with ease. With Big Boy it wasn’t quite the same. He likes to be moving and didn’t want to be seated most of the time. This was fine with me I don’t think he learns any less if he is pacing while I read a story rather then sitting down. Also, he gets distracted more quickly. For example, We danced to a song on Youtube. After the song ended the next video came on and he wanted to watch it. It had a robot in it which reminded him of Autobots. So then he wanted to stop preschool and play Autobots. After he finished playing he came to me and told me he was ready to start preschool again. Above all else I want him to enjoy learning and foster a love for it. I don’t feel like I would help do this by constantly forcing him from one activity to the next when his heart is set on doing something else. He is only three after all so I am learning to be flexible and move at his pace. We had a lot of fun activities planned this week. Here is a picture of our plan for the week. 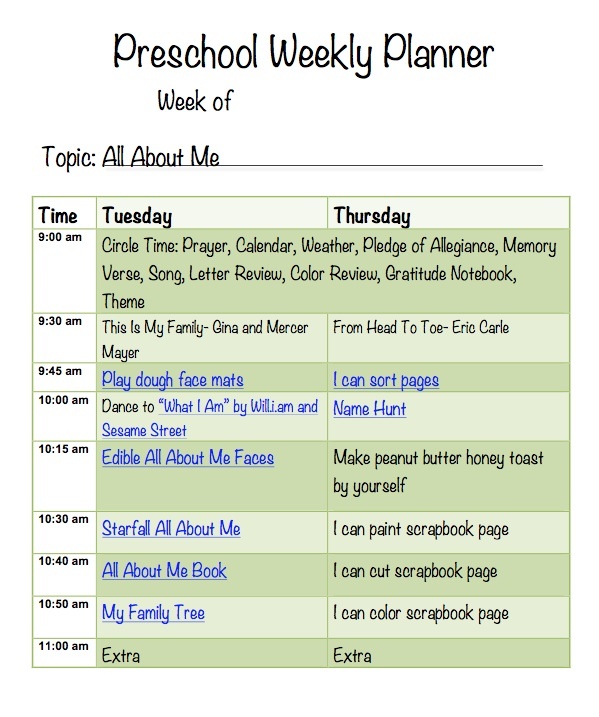 You can download a free copy of out all about me plan at the bottom of this post. We had lots of fun celebrating all the things Big Boy can do by himself and all the things that make him special. 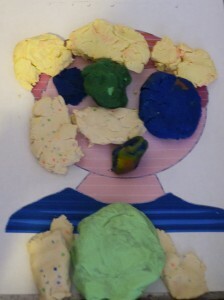 We downloaded a fun play dough face mat from Sparkle Box and Big Boy had fun adding his own play dough features to it to make himself. 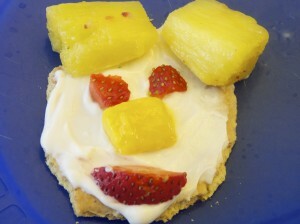 He loved making his own edible face for snack time. 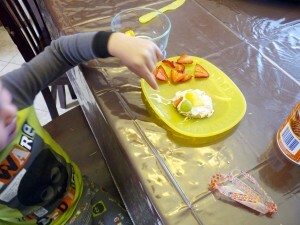 We were inspired by this idea we found on My Preschool-crafts.com, but we used gram crackers, frosting, and fruit instead. 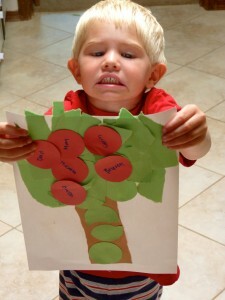 We made a fun family tree with an apple for each of our family members. 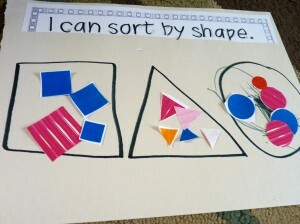 We followed this idea from Fisher Price and made a scrapbook of different things he can do by himself. 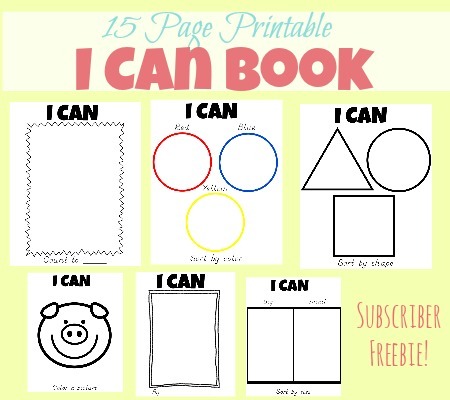 I also found this download for “I can” math posters on teachers pay teacher and instead cut them out and had him sort and glue them to construction paper. Sweet Girl even got to join in on the fun and do some activities with us when she got home from school. Which was extra fun for Big Boy. All together it was a fun week. 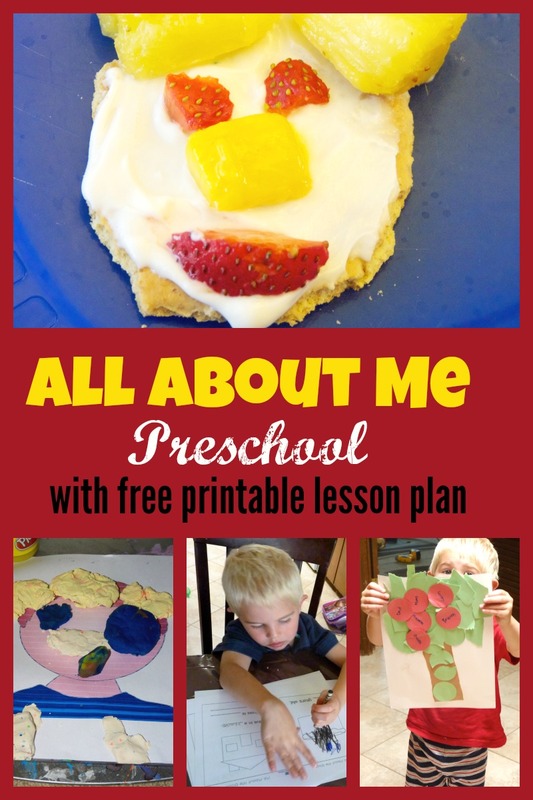 You can download our All About Me preschool plan or for more super fun ideas check out our Pinterest board. 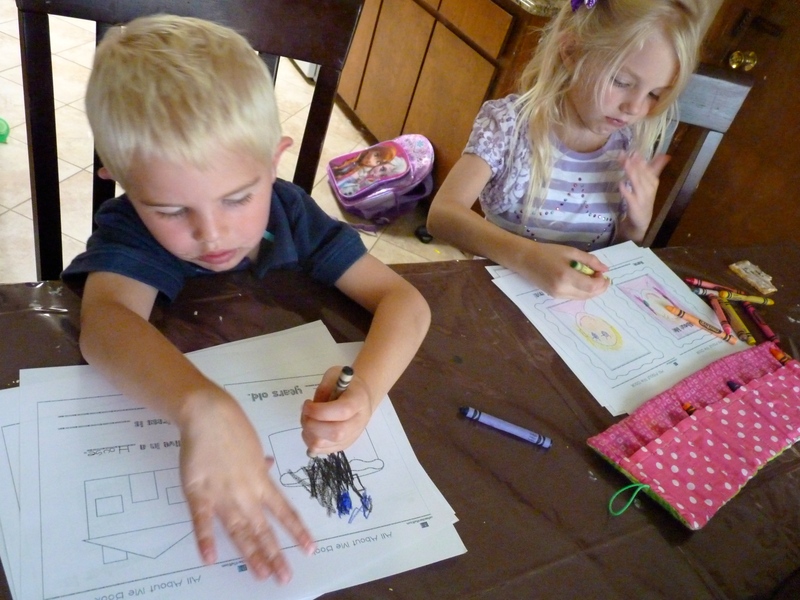 What fun all about me activities have you enjoyed with your kids? Please comment and share! 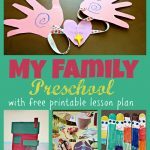 I’m starting a playgroup for young autistic kids with their moms, in March. Thanks for these great ideas!